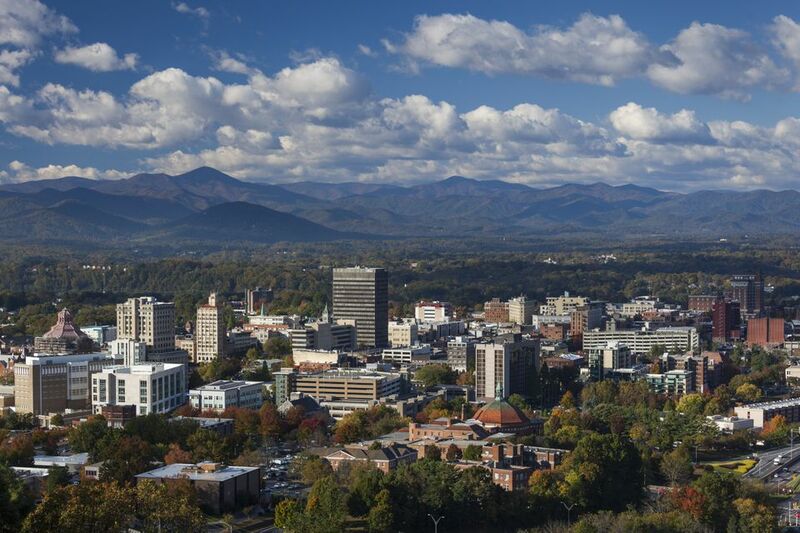 Asheville, North Carolina, is a small city nestled in the Smoky Mountains and rapidly making its mark on the tourist circuit. Thanks to an active artist community, architectural gems, a delicious foodie scene, and bountiful outdoor activities, spending time in Asheville makes for the perfect weekend getaway. Typically, the high season for tourism in Ashville is during the summer and autumn, when visitors descend for outdoor festivals or drive through to enjoy the changing of the fall foliage. Whether you're looking for something outdoors or inside, artistic or adventurous, you'll find the spot for you. The Blue Ridge Parkway is one of America's most famous drives. It spans 469 miles in Virginia and North Carolina, stretching all the way from Shenandoah National Park in Virginia to the Smoky Mountains in North Carolina. The Blue Ridge Parkway doesn't run within Asheville's city limits, but the drive goes around the city and is convenient for travelers staying in Asheville. The Blue Ridge Parkway Association has compiled a handy interactive map for planning the drive which will allow you to filter the route by access points, restaurants, and accommodations along the way. Asheville's River Arts District is heaven for fans of the fine arts. The district is comprised of 22 former industrial and historic buildings that have been transformed into studio spaces. Visitors will find more than 200 artists working in various disciplines including painting, pottery, wood, glass, metal, and jewelry. Walking through the area gives visitors the unique opportunity to observe the artists at work and purchase original pieces as a memento of the trip. The Thomas Wolfe Memorial is a big part of Asheville's history. The novelist, who passed away in 1938 at age 37, was one of Asheville's most famous residents and his memorial is a popular destination in the city. His home was the inspiration for "Dixieland" in Wolfe's novel Look Homeward, Angel. Tours are offered daily and are $5.00 for adults. Several days can be spent exploring the Biltmore Estate, the largest privately-owned house built by the wealthy Vanderbilts in the late 1800s at the height of the Gilded Age. To start your day, follow the estate's self-guided tour on their marked route. The tour takes 1.5 to 2 hours, and there is signage providing information about the estate's rich history along the way. After the overview tour, a specialized tour is another option for a deeper dive. The House Tour, Rooftop Tour, Legacy of the Land Tour, and Winery tours are all fascinating peeks into the long-ago era. The North Carolina Arboretum, a patchwork of gardens and trails set in the in the Southern Appalachian Mountains, is a popular free destination in Asheville (they charge only for parking). The hours vary from winter to summer, and there are changing exhibitions throughout the year. If you're looking to get some exercise on your trip, check out their hiking and biking trails. For a more leisurely trip, stroll through the garden exhibits and explore the beautiful flowers and plants. Asheville residents pride themselves on the local beer scene. The town has more breweries per capita than any other U.S. city, and there a new types of beers available each year. Since you can't really go wrong with any brewery in Asheville, pick one that is convenient and suits your tastes. One of the most popular and famous breweries is Highland Brewery Company, which offers free tours every day. Lexington Glassworks is both a studio and shop in Asheville, where everything on sale is handmade on site. The store boasts of their "open door culture," meaning they invite visitors to view the glassblowing process from start to finish, so feel free to swing by for a look behind-the-scenes. While at the studio you can watch the artists work, walk through the gallery, and find a unique souvenir to take home. If you're interested in a quirky aspect of Asheville, look no further than the Asheville Pinball Museum. The museum has over 80 pinball machines and classic video games to bring out your inner child. Admission for adults is $15.00 and includes unlimited gameplay—no tokens or quarters needed. If you're a pinball fanatic, the museum also buys and sells machines. Unfortunately for parents who might hope to drop off the kids and head out to explore other parts of the city, children under age 12 are required to have an adult with them at all times. The Basilica of Saint Lawrence is Asheville's largest church and a major attraction in the city. The Basilica was completed in 1909 and is described as one of "Asheville's architectural treasures" by the city. The church offers free tours, and you can choose to do a self-guided tour or a scheduled guided tour. There is also a small library and a gift shop. All visitors are welcome to attend Sunday Mass, which takes place at 9:00 a.m, 12 p.m., and 5 pm., with the final service of the day given in Spanish. Looking Glass Falls is one of the most popular waterfalls in North Carolina. According to local lore, "Looking Glass" was named after a rock—when water freezes on this rock, it then looks like a looking glass in the sunlight. Looking Glass Falls is a beautiful natural attraction about an hour drive from Asheville or a perfect stop to make when coming from the Blue Ridge Parkway. In an area with more than 3500 miles of public trout streams, those who like to fish will have an abundance of choices of where to cast out. Streams filled with multiple types of trout and bass are located a short ride from the city, and there are several local shops in downtown ready to supply any required gear or a guide for a day by the water. For families, a trip out to Sun Trout Farms is a perfect outing to experience life raising sustainable fish, tour the facilities, and then swing by the Sunburst Market on the grounds for a fresh catch to take home for dinner. While the woods around Asheville are filled with a variety of wildlife, it'll be much more enjoyable to find them all in one place at the Western North Carolina Nature Center. Since 1974, the organization has preserved and cared for more than sixty types of animals and hundreds of plant species from the Southern Appalachians region. From wolves to owls, and sheep and otters, the Nature Center provides visitors can get a close look at the habitats and habits of the animals. Regular events include activities like a behind-the-scenes tour, Critter Time for Tykes and Tots, and an after-hours Brews & Bear party. During warm weather, there is nothing more relaxing than a leisurely raft ride in the water, and the nearby French Broad River is the ideal setting for the trip. Local guide Blue Heron Whitewater offers a three-hour journey down 5 miles of beautiful tree-lined water for $48.00 per person. Thrill seekers wanting a more high-paced option can opt for the rafting tour through 9 miles of class I-IV whitewater for $70.00, and lunch is included. Since 2009, Jen and Andy Perkins have been handcrafting a selection of award-winning fromage from sharp cheddar to pungent cambozola—earning them multiple national awards. Located 15 minutes outside Asheville, the creamery garden makes for a fantastic lunch spot with stellar views of the nearby mountains. Try a selection of the cheeses along with a glass of wine, and round out the meal with an assortment of other locally sourced delicacies, including fresh bread, stone ground mustard, and preserves and pickles. For the cheese-obsessed, the Blue Ridge Mountain Creamery and Round Mountain Creamery are also well worth visiting. If a nature hike seems a bit dull, try joining a foraging tour to enjoy the great outdoors while finding edible plants and mushrooms. At No Taste Like Home, expert guides lead the way on a 3-hour excursion through the woodlands surrounding Asheville to curate the supplies that are then expertly prepared as appetizers by a local restaurant for the guests after the tour finishes. The guides recommend wearing long pants and bringing bug spray; the walk is easy enough for all athletic levels.